In late October, over 80 members of the U.S. House of Representatives signed a letter urging U.S. Attorney General Jeff Sessions to consider domestic terrorism charges for activists who damage pipelines or disrupt their construction. The letter, drafted by Rep. Ken Buck (R-CO) and co-signed by numerous other representatives, asserts that, while First Amendment protections are important, “violence toward individuals and destruction of property are both illegal and potentially fatal.” It goes on to ask Sessions whether the Patriot Act and Pipeline Safety Act “adequately arm” the federal government to prosecute pipeline protesters and to identify whether such cases fall under the federally recognized definition of domestic terrorism. Notably, the congressmen’s effort to label such acts of protest as domestic terrorism was undertaken with the full support of the oil and gas industry, raising concern regarding the industry’s role in pushing the initiative. Cathy Landry, vice president of communications for INGAA, when questioned by DeSmog, asserted that the INGAA did not “ghostwrite” the letter and that the group was instead asked to support the letter by its author after it had been written. Yet industry influence may have been a factor, given that many of the letter’s co-signers as well as its author, Rep. Buck, have been the recipients of lavish donations from the fossil-fuel industry over the course of their careers. Buck alone has received over $400,000 from the oil and gas industry since 2009, while the four Democrats who signed the letter have taken a combined $3 million in industry contributions over the course of their political careers. Sessions’ response to the letter is likely to be positive. Prior to serving as Attorney General, Sessions, like Buck, had taken nearly $400,000 in campaign contributions from the oil and gas sector during his career in the Senate — frequently voting in favor of expanding drilling, limiting the authority of the Environmental Protection Agency, and increasing domestic fossil-fuel production. In addition, Sessions’ Department of Justice has championed the criminalization of protest — beginning by pursuing hundreds of felony charges against those arrested during protests on Inauguration Day in Washington, including journalists who were caught up in the mass-arrest. The efforts of the Justice Department to criminalize protest have been echoed by state legislatures across the country, where at least 18 states have sought to create harsher penalties for protesters, make protesting more difficult, and even end liability for drivers who injure protesters while driving. 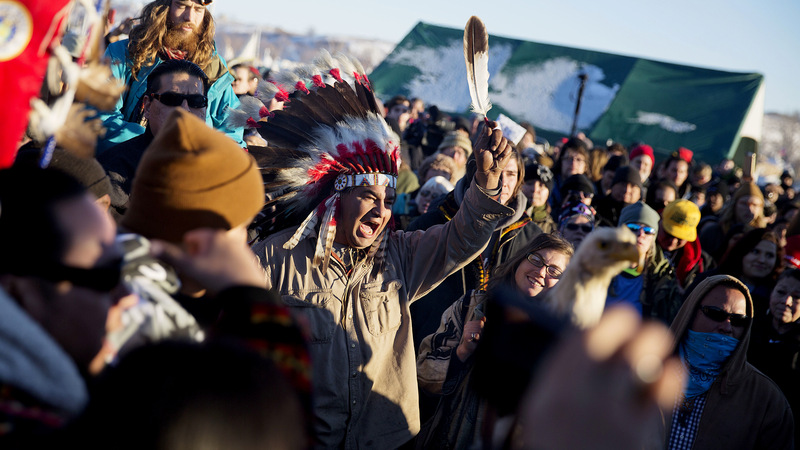 The database’s timely construction on the heels of the congressional letter, as well as its mention of “eco-terrorism” as one of the “regular features” of pipeline protests, suggests the existence of an industry-wide effort to criminalize anti-pipeline activism — an unfortunate but unsurprising outcome given the success of several high-profile anti-pipeline protests last year. Yet, while congressmen and the fossil fuel sector are urging the attorney general to consider protesters as domestic terrorists, numerous high-profile cases of actual domestic terrorism have emerged over the course of the year, including horrific mass shootings and attempted bombings of civilian targets. Despite the uptick in actual domestic terrorism, the Trump administration has proposed sharp cuts to domestic terror prevention programs nationwide. These harbingers of an increasing domestic terror problem, which threatens much more than “critical energy infrastructure,” have failed, however, to garner such significant congressional scrutiny. Instead, it seems many members of Congress are more concerned with expanding the definition of domestic terrorism to include dissenting voices to powerful industries than they are with cracking down on actual incidences of domestic terror that claim innocent American lives.